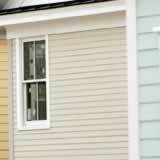 Home | Vinyl Siding Styles | Brickface Siding Styles | Brick veneer: Why do I have color variations? When it comes to exterior siding options that offer a combination of durability and timeless beauty, it may be difficult to beat brick veneer. The cladding has been a choice of homeowners for hundreds of years due to its low maintenance requirements and ability to enhance just about any architectural style. However, while homeowners of yesteryear were often limited to local brick makers, today there is the ability to buy from manufacturers across the country. This convenience provides an almost countless number of brick color and style options for your home, but may also cause problems if you're not careful. You're standing back admiring your home's beautiful new brick veneer when suddenly some color shade differences become apparent. Are your eyes playing tricks? Perhaps not, there are several issues that could cause enough of a color deviation in the siding that it can detract from your home's appearance. Brick. Get all of your brick from the same distributor and if possible, purchase enough initially to do the entire job. Many manufacturers mark their brick cubes with a run, batch, or lot number. make sure they all match. If the cubes aren't marked, ask your mason to pull from multiple cubes when installing the brick. Mortar. Mortar bags are often marked with the color and run date or lot code. Always verify that all the bags are the correct color and the codes are the same prior to your brick installation. If the bags aren't marked with a date or code, at the very least purchase enough mortar to do the entire job at one time and from the same distributor. Sand. About 60 percent of the mortar mixture used to lay brick is composed of sand. While it may be difficult to believe, even a minor difference in sand color can affect mortar shade and the overall appearance of the veneer. When purchasing sand for your project, always verify from the seller that it is all from the same source. Brick and mortar colors can also deviate slightly from the samples distributors and retailers have on display. It is often a good idea to ask your masonry contractor to lay a small sample panel of brick on your home prior to purchasing all the brick and mortar for the project.